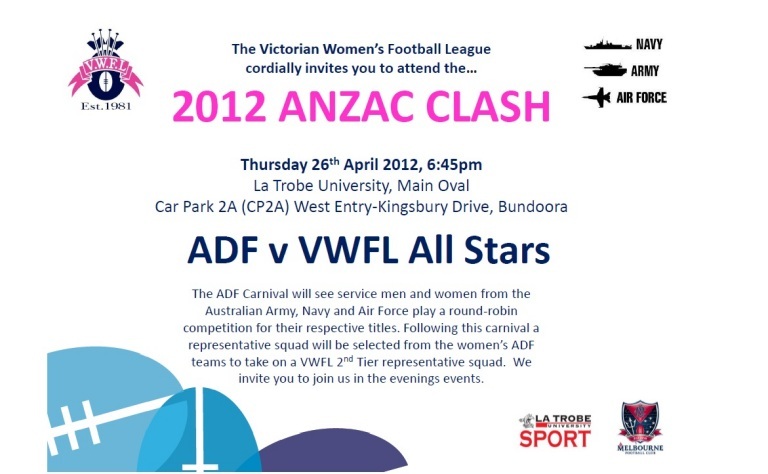 Now in its second year the ANZAC Clash is played between a combined Australian Defence Force side comprising Army, Navy and Air Force personnel and a VWFL All Stars team made up from players in the Reserves, North West and South East competitions. After strong performances in last weeks Australian Defence Force AFL Carnival Jess “Nugget” Foster (Army) has been chosen to captain the ADF team and will play alongside Trish “Mully” Muller (Navy), while Mel “Whitey” White will captain the VWFL All Stars alongside Devil teammates Cara Jeffers, Leonie “Lones” Snart, and Elisha “Muzza” Murrowood. Congratulations on your selection girls and good luck for Thursday!